There are different types of healthcare robots that have emerged over a period of time which includes, surgical robots, rehabilitation robots, diagnosis robots, and radiotherapy robots. The surgical segment accounted for the highest share of the market in the year 2017 due to higher adoption rate across various hospitals, recurrent sales of accessories of these systems, and huge demand for highly efficient replaceable components. The overall enhancement in patient outcomes has a positive impact on the growth and adoption rate of the surgical robotics technology. Rehabilitation robots includes robots for providing assistance and therapy to the patients in their daily living tasks and to the patients suffering from stroke or as disable. The recent scenario involves robots that are used for diagnosis through endoscopy procedures. Radiotherapy robots are costly due to their non-invasive surgical procedure used for the treatment of chronic diseases such as, cancer. The scope of advancements in healthcare robots is very wide due to its high potential in the treatment and faster recovery of the patients. Thus, providing physicians and surgeons with the wider interface and platform for better decision making at the time of procedures and treatment. 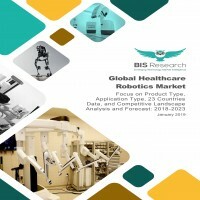 The market analysis of global healthcare robotics includes an in-depth examination of the key ecosystem players, and the key strategies and developments taking place in this market. Additionally, it includes market dynamics (market drivers, opportunities, and challenges), and industry analysis. Presently, the healthcare robotics market can be categorized into four major types of robots that are commercially available. It includes surgical robotics, rehabilitation robotics, diagnostic robots, and radiotherapy robotics. Considerable number of other healthcare robots are presently in the pipeline, that are expected to be commercialized in the upcoming years. The global healthcare robotic market is divided on the basis of product type which includes, robotic systems, instruments and accessories, and services. Based on surgical robot’s application, the healthcare robotics market can further be sub-segmented into categories which includes, General Surgery, Gynecology Surgery, Urology Surgery, Orthopedic Surgery, Neurological Surgery, Transoral Surgery, and Others. The rehabilitation robotics is also further sub-segmented into assistive, therapeutic, and exoskeleton and bionics. Geographically, the market can be segmented into five distinct regions including North America, Europe, Asia-Pacific, Latin America and Middle East and Africa. The purpose of the study is to gain a holistic view of the global healthcare robotics market in terms of various factors influencing it such as key market trends, competitive and regulatory aspects of the market, and scientific innovations into robotics fields, etc. The scope of the report is centered upon conducting a detailed study of the solutions allied with the global healthcare robotics market, which involves different types of healthcare robots. The global healthcare robotics market is segmented into three different parts: product type, application, and region. The report offers the reader with an opportunity to unlock comprehensive insights with respect to the market and helps in forming well informed strategic decisions. The research uncovers some of the substantial parameters that must be taken into consideration before entering the market. This research report aims at answering questions related to various aspects of the global market with the help of the key factors driving the market, threats that can possibly inhibit the overall market growth, and the current growth opportunities that are going to shape the future trajectory of the market expansion. The study considers the growth-share matrix model for a comprehensive study of the global healthcare robotics market, and assesses the factors governing the same. Opportunity matrix and detailed product mapping have been included in the report. The market by region has been further sub-segmented in various countries, and in each sub-segment the key market trends, list of the key players, and the recent developments that have taken place, have been discussed. • What are the key features of the healthcare robotic technology promoting its incorporation in different applications? • What is the impact of requirement of skilled professional? • What would be the future of disruptive robotic technology in the market? • What is the scenario for established and non-established players? • What are key advantages of the robotic-assisted surgical procedure over conventional surgical procedure? • How did the healthcare robotic market evolve and what is its scope in the future? • What are the major market drivers, challenges, and opportunities in the global healthcare robotics market? • What are the key developmental strategies which are implemented by the key players to stand out in this market? • What are the leading companies dominating the global healthcare robotics market? • Which surgical robotics application market would witness massive incorporation of the healthcare robotics in the forecast period? • What are investors’ perceptions about the global healthcare robotics market? Also, who are leading stakeholders of the market holding significant share in market’s intellectual property? • What are the key companies which made substantial investments to aid technological advancements in the market? • What are the regulations pertaining to the global healthcare robotics market? What are initiatives implemented by different government bodies to combat the growing prevalence of different types of diseases? • What was the market value of the leading segments and sub-segments of the global healthcare robotics market? • How will each segment of the global healthcare robotics market grow during the forecast period, and what will be the revenue generated by each of the segments by the end of 2023? • How will the industry evolve during the forecast period 2018-2023? • Which region will contribute to the highest sales of the global healthcare robotics market during the forecast period? 4.1.1 Regulations in the U.S.
8.3 Corindus Vascular Robotics, Inc.
8.16 Zimmer Biomet Holdings, Inc.
Medical errors or adverse effects due to medical treatments are the third leading cause of death in the U.S. Given the fact that in the year 2017, the payouts for medical malpractices in the U.S., was valued $3.9 billion. Further, the chief medical procedures such as diagnosis and surgery were noticed to witness the high number of instances for medical errors. In the year 2017, the medical payouts for medical errors pertaining to diagnosis and surgery together were attributed to 58% of total medical payouts in the U.S. Global incidence of adverse effects due to medical treatments was 34.9 million in the year 2017. The annual incidence of adverse effect due to medical treatment witnessed a compound annual growth of 3.46% from the year 2010 to 2017. Acknowledging the alarming growth trend in the incidence of medical errors, several international organizations such as World Health Organization (WHO) and prominent regulatory bodies such as Food and Drug Administration (FDA) rolled-out stringent regulations and a comprehensive set of guidelines for ensuring patient safety and treatment efficiency. However, despite the strenuous efforts of several governmental bodies, the distressing trend of incidence of medical errors haven’t been controlled to the expected levels. The current scenario signifies the requirement of the automated system to assist physicians in complicated medical procedures such as diagnosis, surgery, and monitoring, among others. The technological advancements in the field of mechatronics, sensor technologies, simulation methodologies, and advanced materials have resulted in the development of robotic systems to aid physicians in complex medical procedures such as surgery, diagnosis, and treatment. The advent of robotic systems and massive-scale incorporation by physicians are perceived to be driving the paradigm shift in the healthcare industry. Enabling physicians to precisely control the outcomes of the medical procedure, the incorporation of robotics systems is acknowledged to be a promising approach to reduce the startling incidence of medical errors globally. The colossal success of surgical robotics systems has significantly expanded the scope of application of automated systems in several other medical procedures such as diagnosis, treatment, rehabilitation, and patient assistance, among others. The purpose of the study is to gain a holistic view of the global healthcare robotics market in terms of various factors influencing it such as recent trends and technological advancements of the market. The scope of this report is centered upon conducting a detailed study of the devices allied with the healthcare robotics market including both commercialized products as well as products that are in the pipeline. The global healthcare robotics market is segmented into three different parts: product type, application, and region. The global market value was estimated using these three different approaches and was validated with one another. These segments are further segmented into several sub-segments to ease the market estimation. The global healthcare robotics market was estimated at $5.40 billion in 2017 and is anticipated to reach $11.44 billion by 2023. Among the different healthcare robots available in the market, surgical robotics contributed to the highest market share of the global healthcare robotics market in 2017. However, rehabilitation robotics is expected to witness the highest CAGR during the forecast period between 2018 and 2023. The increased adoption of prosthetics by the patients with lost limbs attributes to the highest CAGR displayed by the rehabilitation robotics market. Based on product, instruments and accessories occupied higher market share as compared to robotics systems, whereas robotic systems demonstrated the potential to register higher growth rate than instruments and accessories. The global healthcare robotics market is segmented by the geographical regions into North America, Europe, Asia-Pacific, Latin America, and Middle East and Africa Rest-of-the-World (RoW). The RoW regions comprises Latin America and Middle East and Africa. North America is the leading contributor to the global healthcare robotics market with a contribution of more than 65% total healthcare robotics market share in 2017. The North America market is also expected to grow at a CAGR of 11.77% in the forecast period 2018-2023. The global healthcare robotics market is majorly dominated by the U.S. and the European players. However, several emerging countries of Asia-Pacific and Latin America displayed high potential to witness robust growth rate during the period. The U.S.-based company, Intuitive Surgical Inc. offering surgical robots contributed more than 57% of the market value in 2017. The key players who have significant contributions to the global healthcare robotics market are Intuitive Surgical Inc., Varian Medical System, Medtronic plc, Stryker Corporation, Accuray Incorporated, Smith & Nephew plc, Restoration Robotics, ReWalk Robotics, and Mazor Robotics, among others.